Mitsubishi is set to show off the latest version of its Outlander at the Geneva Motor Show in March. While details are a little scarce at the moment, the company is making plenty of claims about the new model. The first bold statement from the brand is that the first generation model coined the term ‘crossover’. Maybe Nissan, or even Honda, would have something to say about that. On the more technical front, Mitsubishi says that the latest version will have a low environmental impact. It aims to get some models emitting less than 130g/km of CO2. This will be helped by two new engines, which will be offered in both two- or four-wheel drive models. Buyers can pick from a 2.0-litre petrol or a 2.2-litre "Clean Diesel". Stop/start will be available as an option, as will a six-speed automatic gearbox. From 2013 the company is hoping to bring a plug-in hybrid version to Europe. Again, there are not definite figures yet, but the Japanese firm is hoping for emissions below 50g/km and a range of almost 500 miles. As well as the usual exterior design changes, the interior has also received a major update. It will feature improved materials, numerous soft-touch finishes, silver accents and gloss black details. The dashboard is, apparently, better designed and coupled with ergonomic steering wheel controls as well as some easy-to-read displays. The usual creature comforts, like dual zone climate control, will also be available. Other new touches include a powered tailgate, for easy access, full third row seating and a flat floor cargo area. There’s also some added safety kit like a lane departure warning system, a forward collision detection system and active cruise control. The new Mitsubishi Outlander will get its full premiere at the Geneva Motor Show in March. 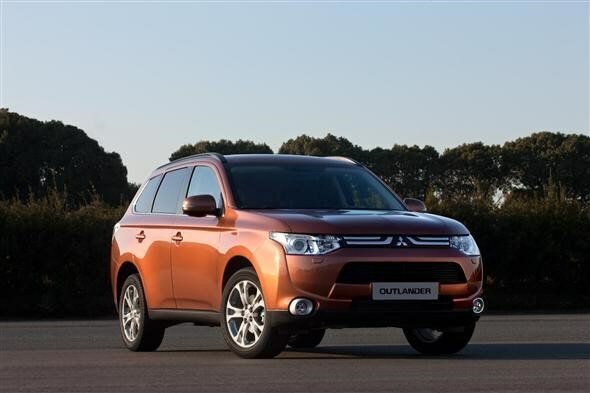 Did you know the most popular review for the Outlander range is the Mitsubishi Outlander review.